Summary: If you want an entertaining movie go and see anything else. Francois Mitterrand was one of the most intriguing and controversial figures of 20th Century French politics. The extent of both his role in the War II French resistance and his collaboration with the Vichy government have been hotly debated while, in his role of President in the 1980s, he managed to bring Socialism (in a fashion at least) to the forefront of French politics. The Last Mitterrand is an account of the final months of the ex-President (Bouquet) as seen through the eyes of idealistic journalist Antoine Moreau (Lespert), who we find interviewing Mitterrand for the purposes of a new book. Moureau hopes to garner the truth about a man who walked the tightrope between left and right wing policies throughout his career but, with illness setting in, Mitterrand is reluctant to discuss some of the darker issues of his past, often preferring to expound his theories on love and literature. Director Robert Guediguian clearly has aspirations of The Last Mitterrand being a great intellectual essay into Socialism, globalisation and ideas of ‘truth’. But in the end the film feels closer to a rambled lecture by a schoolmaster punch-drunk on self-importance. Directors like Godard, Eisenstein or Gillo Pontecorvo demonstrated how passionate, political ideals could be woven into the very fabric of cinema. And this is the important point – they remembered that they were dealing with cinema, and made their arguments much more incendiary by pushing the medium to its limits. In direct contrast, The Last Mitterrand fails as a movie on every level. Take the visuals. Mitterrand claims that “grey” is the colour that best represents France at one point, and it seems to be something that Guediguian has taken far too literally. Sure, it’s not necessarily a bad thing to dispense with the picture-postcard vistas that punctuate so many French movies pumped out for international export. But in its place we get a drab, undistinguished worldview that suits the cinema screen like an eel in a coffee cup. “But it’s not about flashy visuals it’s about the content!” you might holler. Which might all be very well if the script (based Georges-Marc Benamou’s book) didn’t hoover up any remaining signs of life in the picture. Pretentious and boring lines are spat out without enthusiasm or any regard for character, pacing or wit. 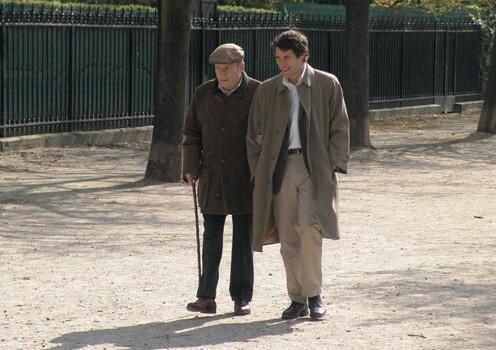 Bouquet does inject Mitterrand with a convincing level of charm and grace, but he’s fatally hampered by a script that fails to get to grips with such a complex, multi-layered character. Indeed, The Last Mitterrand reduces one of the most interesting politicians of 20th Century European politicians into a peculiarly faceless old man. Part of the problem is that the movie chooses to view Mitterrand through the eyes of the reporter Moreau, who makes for entirely charmless company. Aside from a laughable sub-plot involving Moreau’s ex-wife and an emerging new romantic interest, Moreau exists purely as a cipher in which to bounce ideas of socialism off Mitterrand. As a character in his own right he’s worthless, and it makes it difficult for an audience to care about his entire quest to discover the ‘truth’ about Mitterrand. If you want an insight into Mitterrand’s life go read ‘Francois Mitterrand: A Very French President’ by Ronald Tiersky. If you want an argument on socialism go read a George Orwell essay. If you want an entertaining movie go and see anything else.